For February’s Monthly MashUp I chose two pattern designers that I completely adore. 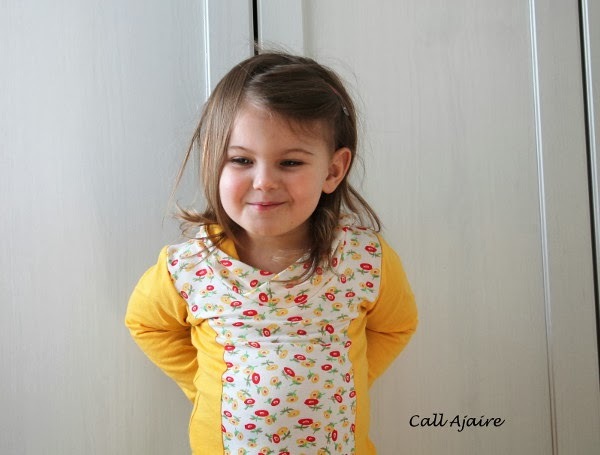 Every pattern I have used from both Sarah (EmmyLouBeeDo) and Amanda (Kitschy Coo) have blown me away. The Bimaa Sweater (LouBee Clothing) and Mini Penny Pinafore (Kitschy Coo) do not disappoint. Sarah’s Bimaa Sweater pattern took the internet by storm over the past few months and I completely understand why. I bought the pattern in the late summer after seeing all the lovely Aussie ladies sewing them up for their winter babies while we endured the heat of August in Maryland. Then it was also a part of the fall Sew Fab Bundle so Bimaas were popping up everywhere. I knew at first glance that the style was too cute not to pass up. And like her other designs the Bimaa is stylish yet super comfy for Bean. There are three neck options, but the most often seen is the dramatic cowl. Bean wears both of her cowl neck Bimaas all the time. The pattern sizing is 12M to 6 and I know we’ll be using it until Bean gets too big to squeeze herself in. 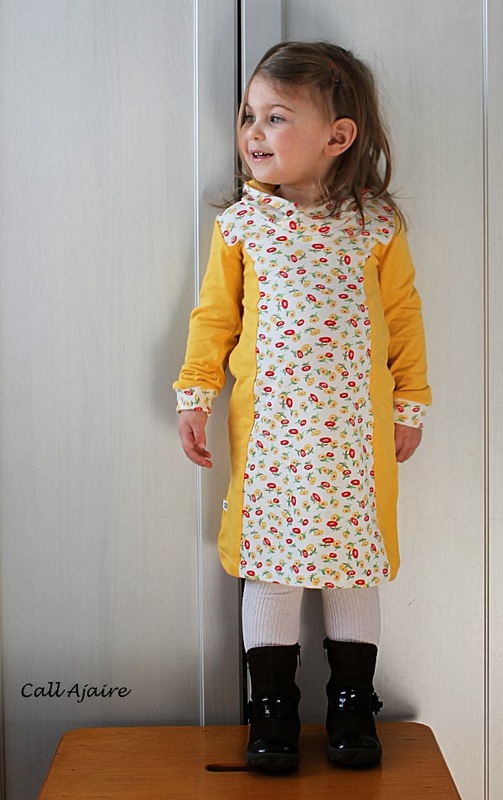 The Mini Penny Pinafore is a relatively new pattern from a well established designer. Amanda is basically responsible for Bean parading around Instagram in her underwear all the time, hehe. Her Boy Cut Briefs are the best underwear pattern ever and they are the only type of undies Bean owns. But back to the amazing new dress. As Amanda is the queen of comfort knits of course this dress is just the perfect shape for running and playing. 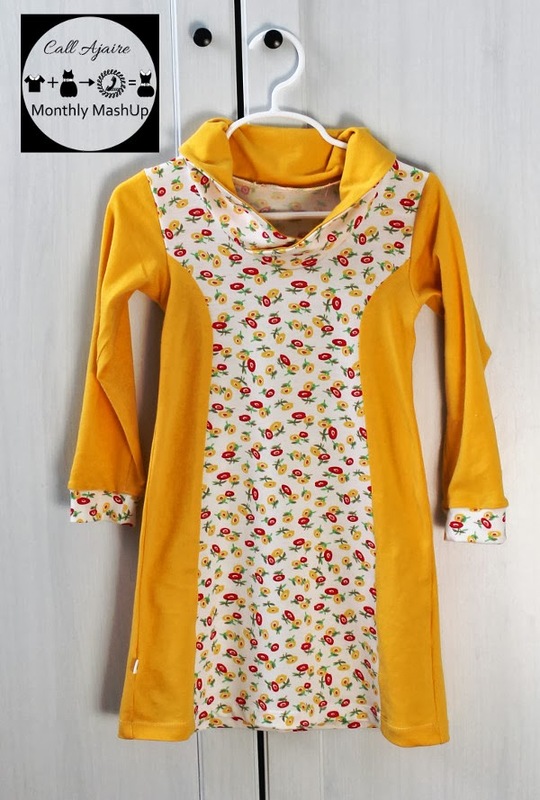 It is meant to be made with stretchy knit and has just the right amount of length to be age appropriate, but still look cute and youthful. And those side panels! Lets talk about those. The opportunity for color blocking is always fun, but they also lend a high design feel to a relatively simple sew. Part of what eases the sewing is the meticulous time Amanda puts in with all her pattern designing. When you cut out the side panel pattern pieces they don’t look at all like they will fit the front and back at their seams, but as you pin the fabric together they magically match up EXACTLY. Designing princess seams that don’t make me want to tear my hair out while I sew takes a lot of skill and is something I truly appreciated while trying to speed through sewing something for my girl. There are options for short or long sleeve and the pattern runs from 6M to 10Years so we will get a lot of use from it. 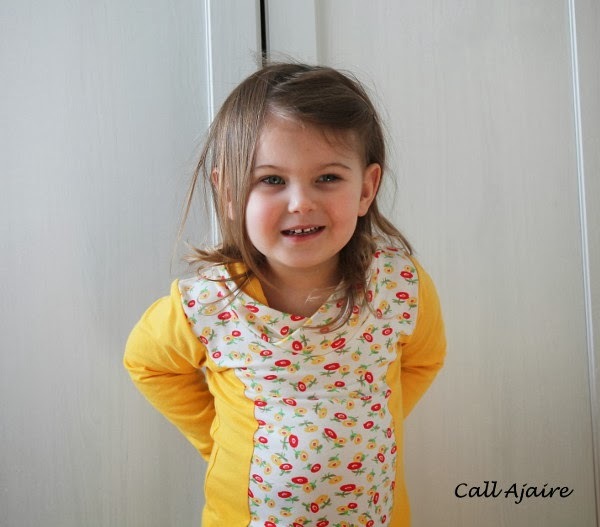 There have been a few simple Bimaa Sweater dresses out there since its release and I even have a simple one cut out for Bean that has been in my to sew pile for awhile now. But for this MashUp I wanted to show you how easy it is to take two already interestingly designed patterns and Mash them together to create even more design options. And trust me when I say this is a super simple MashUp. Both fabrics were bought through Girl Charlee ages ago. Using the neckline of the Bimaa Sweater and the body color blocking and sleeves from the Mini Penny Pinafore adds over 20 more options for what you can create. 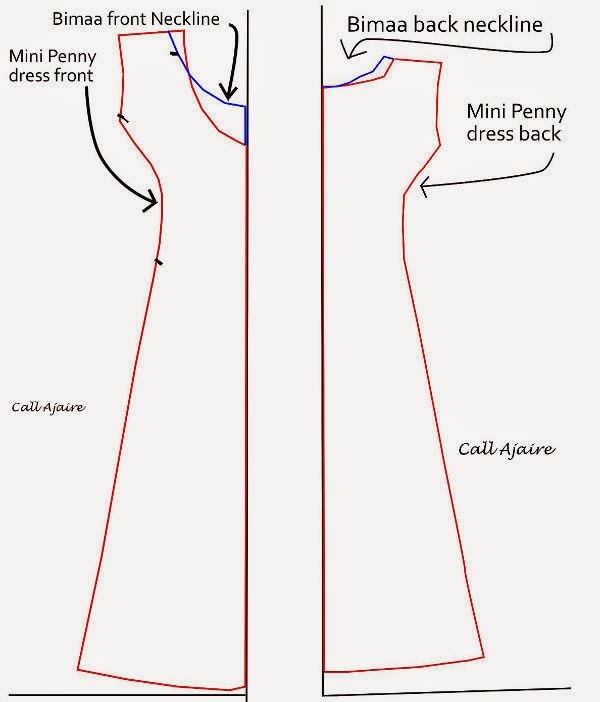 I chose to make a long sleeved color blocked dress with the shawl collar, but all the work for making any of the options is done just with mashing the neckline. I can now take my MashUp pattern and make combos like a cowl neck Mini Penny solid color A-line dress or a hooded color blocked short sleeved top. It’s like having an entirely new pattern in my stash. Start by tracing just the center front and center back pieces of the Mini Penny pattern and any markings. You’ll also need the front and back pieces of the Bimaa Sweater. Both patterns use a seam allowance of 3/8″ which makes a simple MashUp even easier. We are interested in the Bimaa’s neckline for this MashUp so since they are the same seam allowance we only need to match up the shoulder seam and the fold edge of the pattern pieces. Line up the fold edges and then slide the Bimaa pattern along the fold line until the shoulder seams meet. 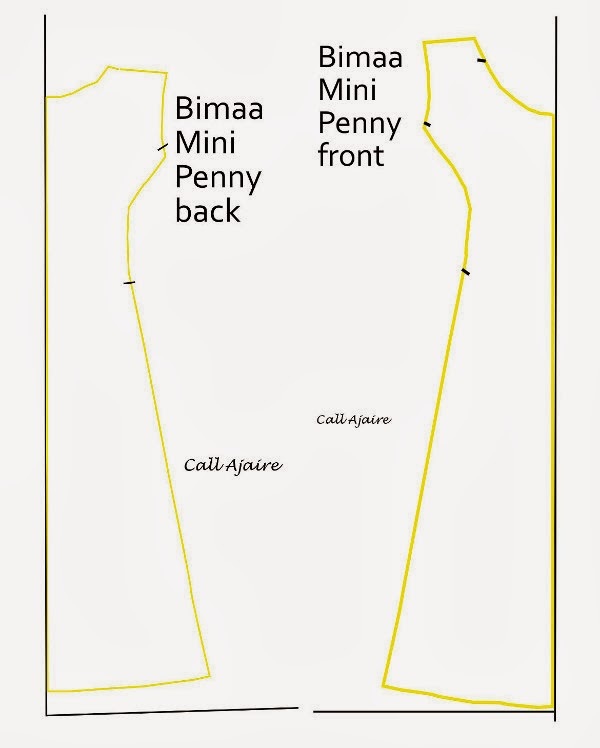 Once the pieces are lined up simply trace the Bimaa necklines of the back and front (blue lines above) onto the already traced Mini Penny pattern pieces (red lines above). 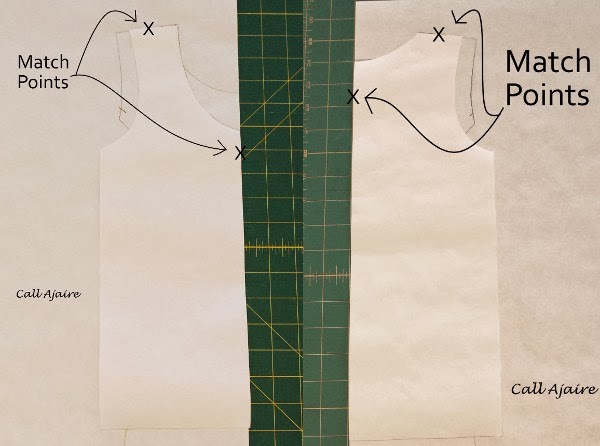 Cut the pattern pieces out using the blue necklines and the red lines everywhere else. And you’re done. Easiest MashUp ever, right? With super cute results. Use whichever neckline option you’d like from the Bimaa Sweater and then the rest of the Mini Penny Pinafore pattern pieces except for its neckband. 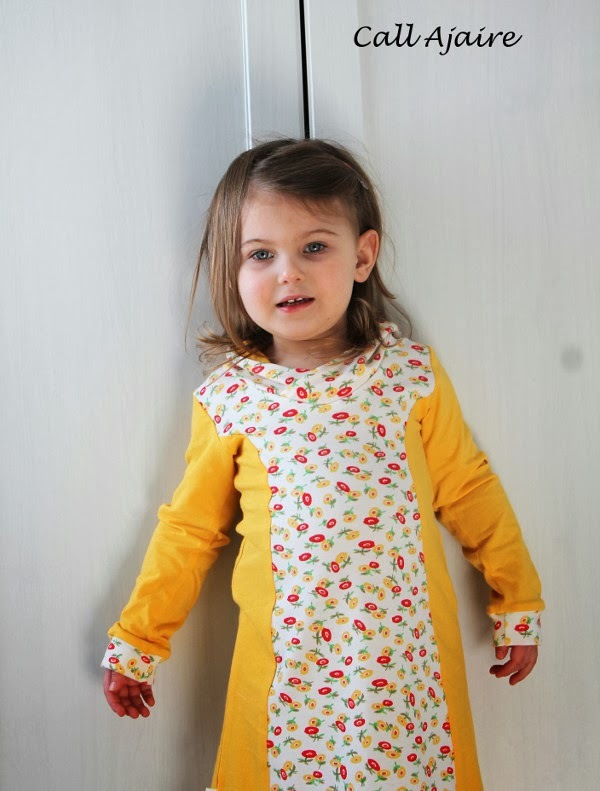 Now this already great Mini Penny Pinafore has three new amazing neckline options which make it even more versatile. I already have a hooded version cut out that I’m really excited about, but I wanted to feature the shawl collar option in this post. I think the Bimaa shawl collar is so perfect, but I rarely see that option out there on the internets. I have a few other shawl collar sweatshirt patterns and they are great, but the way Sarah designed the construction of this one is crazy simple and I’ve never had a shawl collar sit exactly right the first time (using a serger!) with any other pattern. It definitely deserved a moment in the spotlight, hehe. Amanda and Sarah have generously offered to giveaway one of each of the patterns to one lucky reader! Just follow the instructions in the rafflecopter below to enter the giveaway. Want to MashUp your own, but don’t want to wait until the giveaway is over? You can purchase the Bimaa Sweater pattern here and the Mini Penny Pinafore here. I am not an affiliate of either of these ladies. Just a HUGE fan, hehe. Be sure to follow the Monthly MashUp Pinterest board if you’d like some more inspiration on garments to mash. 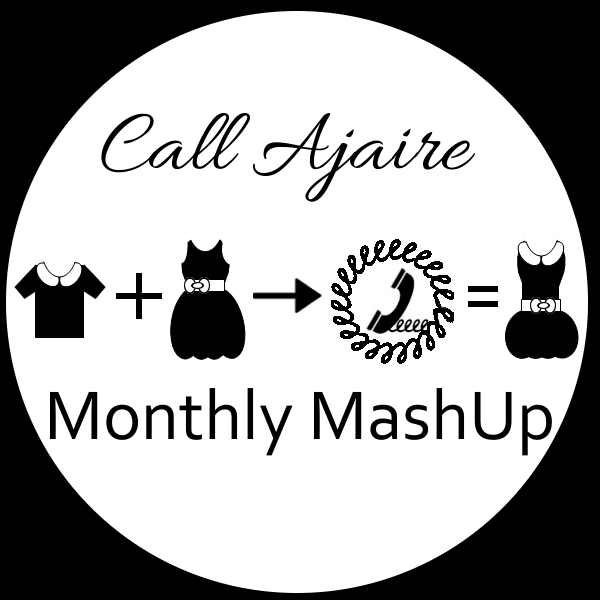 And remember, if you do a MashUp I’d love it if you would share it in the Call Ajaire Monthly MashUp Flickr group! I’d love to have some MashUps to feature next week. **the patterns have been generously donated for the giveaway, but all opinions are mine and I purchased my own patterns before contacting the designers. I was wondering what pattern you used for the underwear, but kept forgeting to ask! (I'm planning to make a whole bunch very soon for the girls.) great mash up! I have some fabric that I've been holding onto for the perfect pattern and now I think the mini penny pinafore would be perfect! The cutest dress E V E R !!! I love this! I just came across this site and I am enjoying it. 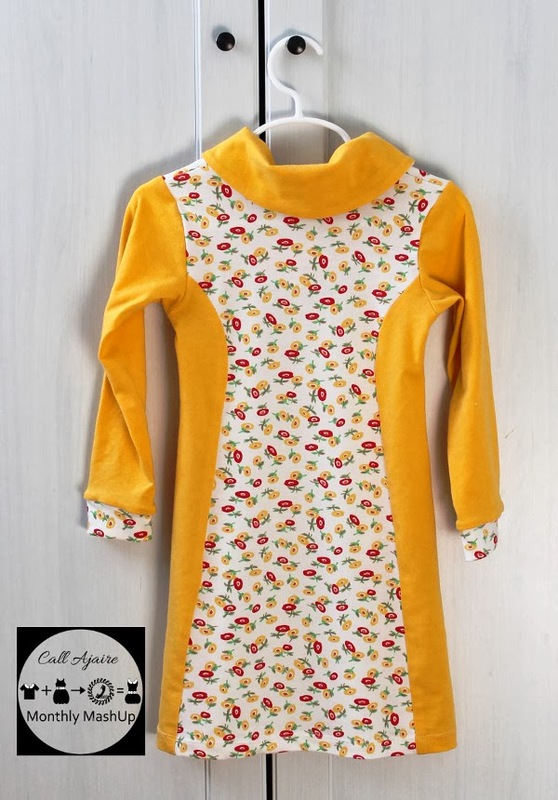 My daughter is older than yours, 6, but I know she's love it if I made another dress for her. It's been awhile. 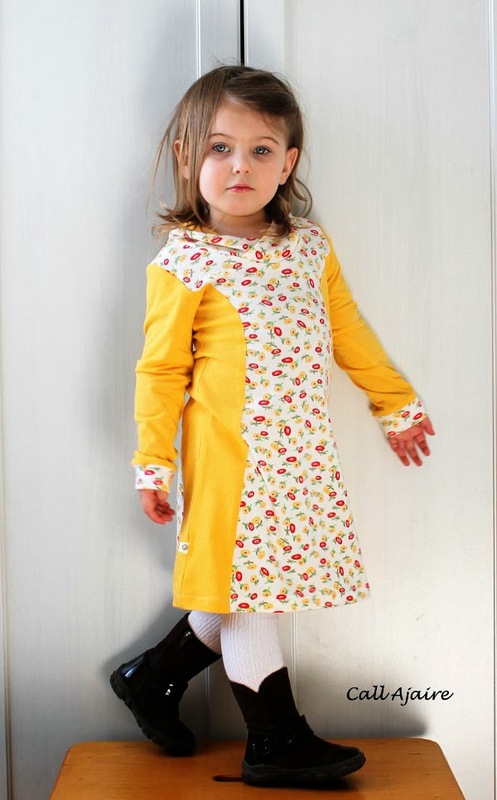 The mini penny pinafore would be perfect! I love the series. It's got me looking through my patterns to see what kind of mash ups I can come up with. I love this! It would look adorable on my granddaughter. Thanks for the idea and tutorial! How cute is that. I like the combo of the two! Great mash up!! Thanks for the tut& giveaway!! This is perfect! Holy crap you are a genius! I love the fabric of course, but the design is just awesome. Such a smart mash up. I haven't sewn up a Bimaa yet, but I have made a Lady Skater and it definitely made me feel Sew all KItschyCoo patterns! I'm sure the pinafore would be great. This is such a fun series. I really love this particular combo! Love this one! It looks so cute on her! Love the series! Such a great idea! Adorable! The color combos are great and it looks so cute on her. Can't wait to see what you mash up next month! All these lovely Bimaas have been making me regret not getting that bundle last fall. It would have gotten plenty of use with my two wee ones around. It looks like a great dress! This is so great! I love the color blocking with the shawl collar! and…what a great idea for a series. COngrats on project runway as well!! I'll be cheering for you!